Democratic gubernatorial candidate Wendy Davis enjoyed rising financial success as a Fort Worth attorney last year and took home about $284,000, more than double what she reported making in 2010, according to tax records released Wednesday by her campaign. The federal filings show the state senator's Newby Davis law firm, which she founded with former Gov. Rick Perry chief of staff Brian Newby, has become her most lucrative source of income. She reported earning more than $154,000 last year from the partnership, which has multiple public-sector clients. Davis launched her campaign to replace Perry in October after months of speculation and pleas from Democrats, who haven't won a statewide office since 1994. 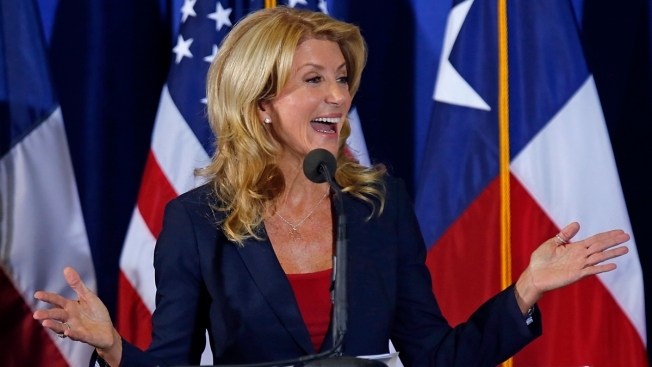 She became a national political star following an 11-hour filibuster this summer that temporarily blocked new abortion restrictions in Texas. Her main Republican rival in the race, Texas Attorney General Greg Abbott, in August released his tax returns dating to 2010. He and his wife brought home about $200,000 in 2012, but his filings don't reflect millions in tax-exempt dollars Abbott still collects from a settlement over a 1984 accident that left him paralyzed from the waist down. Like Abbott, Davis didn't report substantial charitable giving. She claimed $950 in charitable deductions in 2012, less than the $3,014 claimed by Abbott. The most charitable dollars she wrote-off was $2,700 in 2010, or about 2 percent of her reported $131,000 adjusted gross income that year. J.D. Angle, a top Davis campaign adviser, said the filing "doesn't reflect all of her giving." He also said Davis currently has no plans to release federal tax filings prior to 2010, which Abbott has also declined to provide. In August, Abbott said he thought his 2010-12 returns were "a good standard." Statewide candidates are not required to make their federal tax filings public, but releasing only three years is far less transparent than the standard set by Perry, who released tax returns dating to the 1990s in campaigns that made him Texas' longest-serving governor. Perry isn't seeking re-election as governor after 14 years in office but hasn't ruled out another run for the White House in 2016. Davis is a former Fort Worth city councilwoman who was first elected to the Texas Senate in 2009. Like all elected legislators, she receives $7,200 annually for the job. Angle said Davis is "wrapping up" commitments with current clients at her law firm and will not be taking new ones so she can focus on her run for governor. He said Davis also is working on getting permission to reveal the names of her firm's public-sector clients.